This is one of my daughters favorite appetizers, she gets all excited when I make this. The warm Brie and sweet preserves makes a perfect contrasting combo. Served warm or cold this cheese is mild and pleasing. Perfect for your holiday parties. Carefully slice the top rind off your round of cheese, without wasting to much cheese. Although the rind itself is edible, I do this so the cheese can ooze and bubble up and melt together with the jam. Place round in the center of a pie plate. 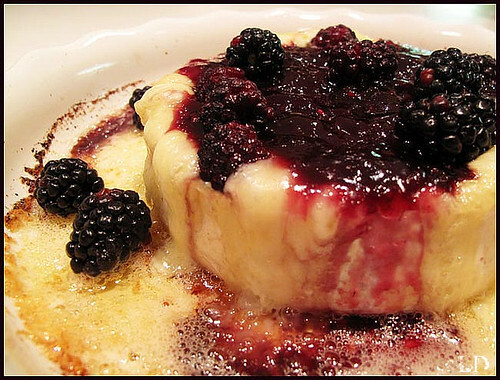 Dollop 3 tablespoons of blackberry jam in the center of your cheese round. sprinkle fresh blackberries on the top. Bake at 400˙until cheese is bubbly and brown on top. Serve with crackers. Oh wow!! That looks amazing, Laura!! I am making this for my potluck brunch Friday Dec 11th.Thanks ,Laura! OMG! My mouth is watering! YUMMO!